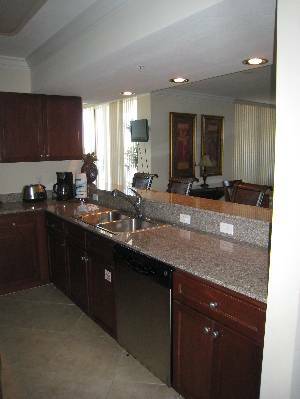 Osprey 603 is a beautiful 2500 square ft three bedroom and three bath condo. The surrounding views from this corner, waterfront unit are breathtaking. The master suite is decorated in beautiful furnishings leading into a lovely master bath with jacuzzi tub and a large walk-in closet giving you the much needed space for your luggage and beach gear as well as plenty of hanging space for your clothing. You will have private access to the patio from the sliding glass doors in the master suite. The guest suite is just as nice offering a large room decorated using classic coloring and has it's own personal bath and closets. 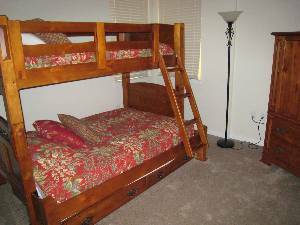 In the third guest room you will find twin bunk beds with an underbed trundle. The bunk room is the perfect place for the kids to hang out when not on the beach. Flat screen TVs are found in each room. Stainless Steel appliances are the attention grabbers in the large kitchen; which is fully equippped with everything you will need during your stay. There is seating for 6 at the dining table. Additional seating is available at the adjacent bar area. You have plenty of room to relax in the spacious living area with plenty of comfortable seating to enjoy the full entertainment center. The queen sleeper sofa in this area will accomodate two additional guests. 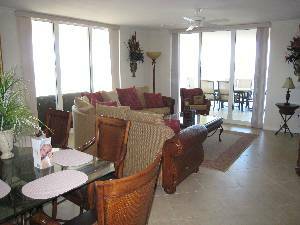 Open your patio doors in the living area to enjoy the tropical air. When you walk onto your balcony, you will see the lazy river circling around the three pools and two hot tubs. 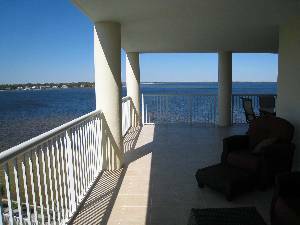 You will also enjoy the view of the Choctawatchee Bay. The lazy river is the main attraction here and you will certainly enjoy the evening views when the fiber optic display begins changing the color of the water traveling in the lazy river. It will probably entice you to take a late evening float in the warm current to relax. 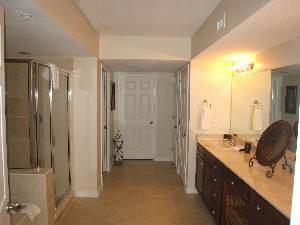 This condo is furnished beautifully, offers tiled floor in the main areas, carpet in the bedrooms, all linens and bedding, kitchen supplies, washer and dryer in a laundry area, top of the line appliances, cable TV, DVD in all bedrooms and living area with a VCR/DVD combo in the bunkroom. An on-site gym with the latest fitness equipment is available for your workout after enjoying the fabulous local fresh seafood or any cuisine you desire. 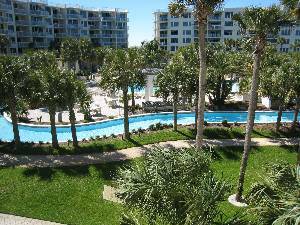 The connector walkway over Highway 98 between the bayside and the gulfside allows guests to enjoy all amenities of Destin West Gulfside more quickly. Kids especially enjoy the water splash garden located at the gulfside beach walkway. Four miles of private beach are also yours to enjoy. Okaloosa Island is one of the best kept secrets on the Panhandle. Our guests are near countless boutiques and galleries; as well as world class golfing, fishing, boating and all types of water recreation. Shopping is only minutes away in any direction. Outlet Mall shopping is available along with the typical beach shops as well as specialized shops unique to the Destin area. In the old fashioned area, there are even quaint antique stores to browse. We can honestly say, there really is something to make everyone happy here! The Crab Trap - Great waterfront and outdoor dining, featuring fresh–daily seafood and lots more. A $250.00 deposit is required to confirm a reservation. Taxes of 11% and Cleaning fees are not included in the weekly Rates. 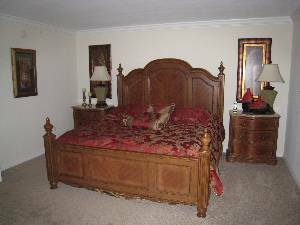 Deposit: A $250.00 deposit is required to confirm a reservation. Cancellations and Refunds: A $100.00 nonrefundable cancellation fee will be charged after booking.